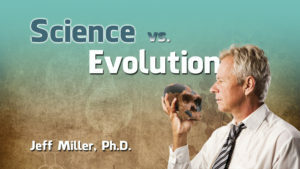 Join a former atheist and evolutionist in looking at the theory of evolution. 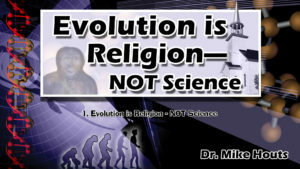 One of the greatest deceptions perpetrated by atheists and humanists is that the theory of evolution is somehow “science.” Dr. Mike Houts demonstrates in this 6 lesson program that, in reality, evolution is merely a tenet of the false religion of atheism. Many people in the world today hold fast to the theory of evolution, even in the face of insurmountable evidence against it. 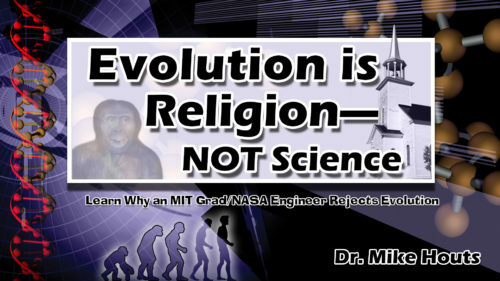 Knowing what the evolutionists’ stance and belief is can be a very useful tool to help defeat this false theory. Join Dr. Mike Houts as he presents some of the common arguments used by evolutionists, and what counter arguments Christians can use against this false science. When the layers of evolution are peeled back and its true basis is looked at with an honest heart, one can clearly see its many faults. The theory of evolution has many gaping holes that those who adhere to its tenets refuse to let go, even when they are faced with the fact that evolution is unscientific. In this session, Dr. Mike Houts explores the faulty ideas of evolution to show that God’s word is the accurate account of creation. Based on the known truths of science, is it plausible for life to evolve? When true science is applied to the physical world and universe around us, it becomes very apparent that true science is the enemy of the evolutionist. In this session, Dr. Mike Houts continues his presentation showing that show true science is the enemy of evolution. Romans 1:20 says, “For since the creation of the world His invisible attributes are clearly seen..so that men are without excuse.” God expects us to know about Him and His existence based on the evidence that He has given us. Join Dr. Mike Houts as he takes an in-depth look at some of the arguments used by evolutionists and shows how God’s word is accurate and true in regards to all matters, including science. Does it really matter if one believes in a multi-billion year old universe or a relatively young universe? 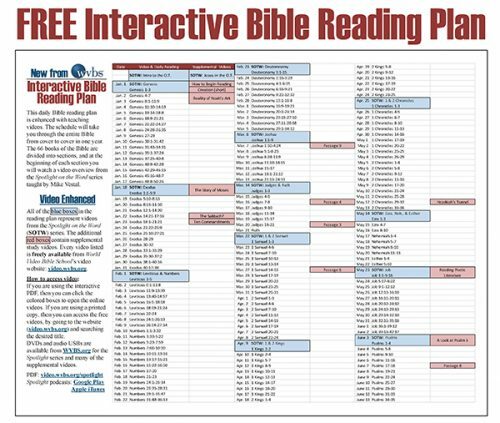 Should all Scripture be taken literally or does God grant some leniency? In this session, Dr. Mike Houts answers these questions and presents the importance of understanding God’s word as truth. The theory of evolution claims that the universe is several billion years old and evolutionists assert that they have evidence to back this up. But what really is this evidence and how should a Christian react to these claims? Join Dr. Mike Houts in this final session of “Evolution is Religion Not Science” as he looks at the topic of the age of the universe and the Christian’s response.